Know how hard it is to find just the right pair of jeans? Some jeans are meant for one type of body, and others for another body shape entirely (and probably not yours). As women, we try on a dozen, maybe a hundred different pairs, until we find just the right one. They are definitely not “one-size fits all”. So it is with handguns. Some firearms work better for women with bigger frames and others for a more petite hand. Some guns are heavy where others may be pretty lightweight. 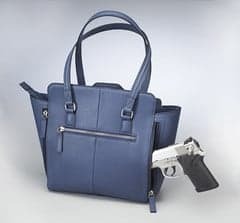 And of course, any handgun we ladies buy has to fit into our CCW purse, so thats another consideration altogether. One of the bestselling handguns out there is the Glock 19 in 9mm. It seems to be a dependable and reliable handgun, with the advantage of being easily concealed with a proper holster. The Gen 4 is recommended as it comes, with interchangeable back straps allowing the shooter to customize the pistol to fit his or her hand. At www.GunHandbags.com, we have found that many of our customers carry the Glock 19 and it is well-suited to fit most of our medium and large size conceal carry purses (see our sizing categories under product descriptions). 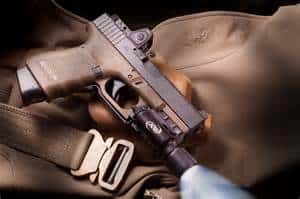 On the heels of the Glock in terms of sales is Smith & Wesson’s M&P series. The grip frame is slightly shorter, aiding in concealability. Like the Glock, it has interchangeable back straps, allowing the shooter to customize the size of the grip. My only gripe with the M&P series is the factory trigger. I remedied this by replacing mine with an aftermarket trigger by Apex and having done so, it has become my favorite carry gun, says Searson. It is a great gun for women, he added. Another striker fired handgun, but this one is completely modular allowing you to not merely change back straps, but frame sizes, barrel lengths and calibers. 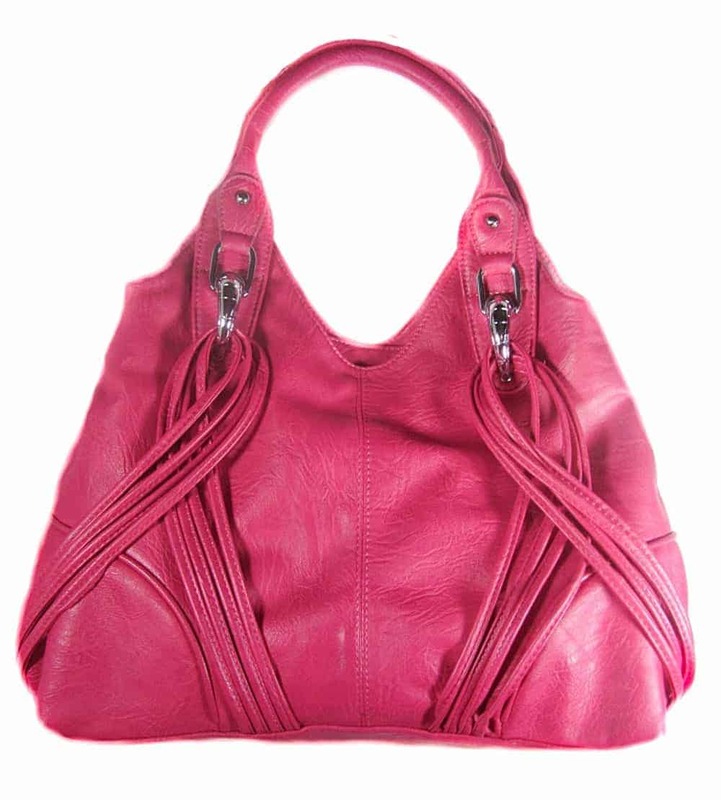 It is a handgun that is well-suited for conceal carry purses, due to its adaptability and size. Searson prefers his carry guns in 9mm, but advises women that if you want to step up to 45 ACP, 40 S&W or 357 SIG without having to purchase another firearm, then this might be the one for you. Ruger offers the striker fired SR9C with what they term as the slimmest 9mm double stack magazine on the market. Holding one in the hand makes this claim seem likely. The company offers one of the best warranties in the industry and the quality control is superb. This pistol may seem foreign to most ears, but the Steyr S9A1 is an ideal handgun for most women. The grip frame is on the smaller size for a double stack 9mm, it boasts the lowest bore axis of virtually any other handgun and its trapezoidal sighting system seems more intuitive than the standard three-dot sight -picture found elsewhere. Unfortunately only 10-round magazines that are permanently blocked to that number are available. Magazines of greater capacity intended for the company’s M9 and L9 series will fit, however. Ruger released another 9mm compact pistol known as the LC9. This was a single stack design and almost made the cut, until we remembered this offering in 380 ACP. A little on the large side for a 380, it makes up for that shortcoming by bringing accuracy and controllability to the table for those who may lack grip strength or suffer from carpal tunnel syndrome and cannot handle the sharp recoil of a small handgun. For older women or women who spend a lot of time at the computer and have dealt with carpal tunnel, this may be a gun for you. Similar to the LC380 in size is the Glock 42. Originally dismissed as being “too big for a 380”, this little pistol has proven itself to be a favorite among male and female shooters alike. For those who worry about the use of a 380 ACP as it is not exactly a “police round”, the G42 is in use by several law enforcement agencies in a backup capacity. Initially we dismissed the Rossi as being a “cheap revolver” until we got one in our hands. We were impressed by its accuracy, reliability and light weight. This revolver has a very futuristic look and that is because its designer was years ahead of his time in terms of engineering and made the most significant changes to the modern revolver since the swing-out cylinder in 1899. The Rhino fires from the bottom cylinder, putting recoil more in line with the center of the palm and giving the shooter one of the lowest bore axes we have ever seen. An octagonal cylinder helps in concealment and the concealed hammer does not snag on the draw. Their grip contour is amazing and this is one where a manufacturer may have really nailed one size fits almost everyone. Lastly, the Boberg Arms XR9S may be one of the lightest recoiling handguns we have ever tried. Its unique action aids in velocity by placing the chamber the furthest rearward on any semi auto pistol in history and the construction of the grip aids in eliminating felt recoil. Boberg was recently purchased by Bond arms of Texas and supply may be making these little pistols hard to find, but they are worth the wait when you do find one. It’s always a good idea to do a good deal of shopping before making your purchase. However, any of these top ten handguns for women to conceal carry make ideal purchases.